In his new role as Interim Zoo Director of the Alabama Gulf Coast Zoo, Dr. Adam Langston has never been one to shy away from challenges. Becoming the sole veterinarian to a zoo filled with exotic animals required more than just medical and surgical skills when he arrived on the scene over 12 years ago. It called upon acumen above and beyond a small town vet clinic practice. Racing to save the life of a Bengal tiger or treating an African lion with cancer under the anxious watch of zookeepers, not to mention the public, made Dr. Langston uniquely qualified to become one of the zoo’s most ardent animal advocates. It was while he worked on a horse farm at the University of Kentucky in Lexington that he decided to become a veterinarian. He also met his wife Niesje there and after he received his B.S., they both went on to Auburn University and graduated from the College of Veterinary Medicine. They returned to Kentucky and Dr. Langston joined a practice where he learned to perform a wide range of surgical and medical procedures on many different species of animals, which would ultimately serve him extremely well when he became the Alabama Gulf Coast Zoo’s vet. 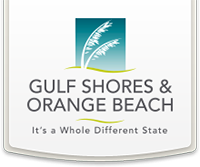 By the end of 2006, in search of warm weather and to pursue his other passion as an avid sailor, Dr. Langston moved his family to the Gulf Coast of Alabama. He joined a practice that was devoted to the Zoo’s veterinary care and he began treating every animal, from black bears to black leopards. When he moved to another clinic, he continued this care and became the Zoo’s sole veterinarian in 2016. 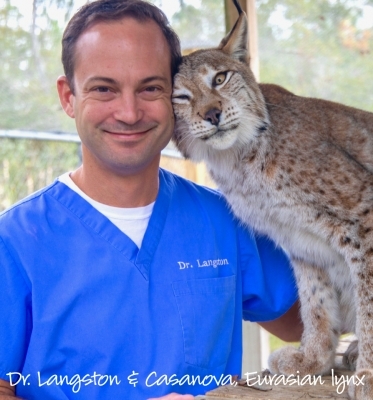 Over these many years, Dr. Langston has formed a deep bond, not just with the zookeepers at the Alabama Gulf Coast Zoo, but also with its inhabitants. 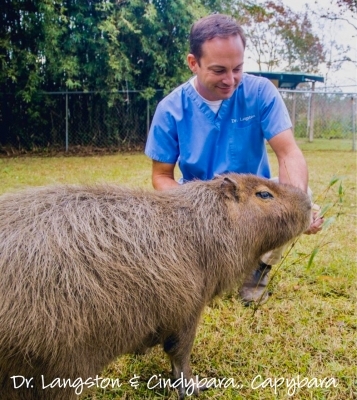 When asked which animal is his favorite, he replies, “The one who is sick and needs my help, and I am desperately trying to make them better.” He is a fierce proponent of continuing to provide excellent care and compassion for all of the animals, while supporting the dedicated staff who work tirelessly on their behalf. As a unified team, Dr. Langston believes that the Alabama Gulf Coast Zoo can provide an important platform for wildlife and conservation education that will reach far into the future. Dr. Langston and his wife Niesje, also a local veterinarian, have two teenagers, Anna and Will, and of course, a menagerie of creatures at home. When not caring for animals, they are all on the water in their 42-ft. sailboat fittingly called “On Call” which has taken them on many seafaring adventures, from Pensacola, Florida to Havana, Cuba and across the Gulf to Isla Mujeres, Mexico. Dr. Langston embraces more exciting challenges ahead, both at sea and at the Alabama Gulf Coast Zoo.